Encouraged by the Food Geek, a great guy I met on Twitter (follow me! ), I bought myself a pasta roller the other day. It's an interesting device. It reminds me of a miniature laundry mangle, only for pasta. You can buy all kinds of attachments for cutting different sizes of pasta noodles, and it even has a motor you can buy to turn the crank for you. 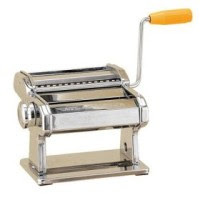 As cool as this pasta roller is, it's also a pain in the flank steak. I used it for the fist time last Saturday. Two good things happened. 1. My son and I made great tasting fresh pasta. 2. I learned a lot about what not to do with a pasta roller. Most of what I learned has to do with all the bad things that happened. Fortunately, I still have all of my fingers, and they're the same shape they were before I started. My problem was one of assumed engineering, not potential finger mangling. It turns out that pasta rollers have little built in c-clamps to attach it to your counter. Good idea. The pasta roller likes to try and move around when you're cranking that handle. The problem came in when I discovered that the lip on my kitchen counters isn't wide enough for the c-clamp. Oh, I can get it started, but then I can't tighten it up without the screw handle smacking up against the side of my counter. Okay. I can't work on the counter so I'll just move it to my table and clamp it down, there. No such luck. My table has a beveled edge on the underside and so there's nothing for the c-clamp to push against. In a fit of misguided inspiration, I grabbed a large cutting board I've got. (It's not really a cutting board. It's the excess material left over when you cut a hole into a counter top to install a sink. It's a great board, though.) I'll clamp the roller to the cutting board! Brilliant Me didn't take into account that now the cutting board, and the pasta roller, would start moving all over the, scratching up my table, when I turned the crank. Grumbling to myself (and using several words I had to repent of, later), I finally came up with this bizarre solution: First, I clamped the pasta roller to the cutting board. Next, I got a larger c-clamp, a 12 inch one I use to change the brake pads on my car, to clamp the cutting board to the table. Finally! A stable work surface! Oh, but this was only half the fun. In order to clean all the industrial grime left over from the manufacturing of my pasta roller, it's recommended that you clean the roller with a soft cloth, and then run a portion of pasta dough through the rollers several times. No problem. Not wanting to eat dirty petroleum I did just as the instructions recommended. I made up a bunch of pasta dough, cut a small section off of it, ran that section through the roller several times, and tossed the dirty thing in the garbage. Hmmm. That wasn't too bad. I didn't see anything worth noting on the dough but, better safe than sorry. Thinking myself safe, I cut a larger portion of pasta dough and started rolling. After a few passes I noticed thin black lines of industrial motor oil showing up in the dough. This didn't happen with the first piece. What's going on? It turns out (no pun intended) that it was coming off the sides of the rollers every time the pasta got wide enough to hit them. Rats! I'd have to throw this piece away, too! After going through about a third of the pasta dough, I finally started getting results that looked clean enough that I dared to eat them. Guess what? Rolling pasta isn't as easy as it looks. Oh, the roller does a great job pressing it out. Don't get me wrong. It gradually flattens the dough until it gets thin enough to almost see through. The trouble is that every time it makes the piece thinner, it also makes it longer. A lot longer. Very very much longer. So long that you have to call in a pack of cub scouts to help you. I had to start cutting the pieces in half, just to get the things to go through without getting all folded together. Then the dough started getting sticky. I had to dust it with flour a couple of times just to get it to quick sticking together and making me start over. The third problem came when it was time to dry the pasta. You need to let it dry for a few minutes, but not too long, so that it will cut well. I had made enough dough to make six servings, or so the recipe said. I'd lost at least two of those servings cleaning the roller. Even when I was at the theoretical four servings, I ran out of counter space. I had no where to put the pasta I'd rolled out! I started hanging the pieces I'd rolled earlier on the backs of the dining room chairs. It was only then that it occurred to my why I kept seeing pictures of noodles hanging to dry from what amounted to clothes lines stretched across the rooms in commercial pasta making businesses. I wonder if that's how pasta was first invented. Maybe it all came from a horrible laundry accident involving flour and eggs. Even though my first experience making pasta was very frustrating, the results were phenomenal. My son helped me out by cutting the pasta into maltagliati. Maltagliati translates as "badly cut." It's just flat triangles of fresh pasta. We tossed it with some bacon, onions, garlic and peas that had been sautéed in olive oil. It was delicious. It was also enough pasta to feed me, my wife and four children, and still have leftovers. So much for the "six servings" mentioned in the recipe. Now that I've learned a few things, making fresh pasta shouldn't be so hard the next time - which will be very soon. It was a lot of work but, oh my. Like I said. It was delicious. Maybe I'll make fettuccine, next time. Pasta, dried or fresh, is an amazingly versatile ingredient. I like to think of it as a foundation ingredient, providing a basic building block for a near infinite variety of tasty and delicious dishes. Dried pasta, along with grains and beans, form the backbone of any good pantry. Dried pasta keeps very well in cool, dry, places. It will stay “good” for up to two years if it's kept this way. This fact alone makes it a wonderful staple ingredient for long term food storage, an important topic for most Mormons. Dried pasta comes in all shapes and sizes. Authentic recipes will use specific shapes, but most types of pasta are interchangeable. Shape is mostly a matter of personal choice, although certain shapes lend themselves better to certain sauces. Shell shaped pastas, such as conchiglie or lumache, are great when paired with chunky sauces. They hold the larger chunks of meat and vegetables much better than other pastas. Tubular pasta is fun, too. Macaroni is probably most common tubular pasta. I like some of the others, such as penne (quill) or rigatoni, better. Smooth shapes are best served with creamy sauces. Larger, fatter, or ridged varieties, can be good for trapping chunkier or meatier sauces. Shorter solid shapes, like fusilli (corkscrew) and farfalle (bow tie) are very popular. They are versatile shapes and go well with most sauces. I think they work particularly well with cream or vegetable sauces. Wide eggs noodles are great when served with stroganoff, or broth soups. In America, the most popular long pasta is undoubtedly spaghetti. Sturdy, thick spaghetti goes well with most any sauce, as long as the chunks of meat, fish, or vegetables are small. Spaghettini, spaghetti's more narrow cousin, is best with lighter sauces. If you really want to go thin, try capelli d'angelo (angel hair pasta). It's an ultra-fine noodle so, it works best tossed with ingredients that will stick all by themselves – olive oil, butter, pepper, grated parmesan or romano cheese, come to mind. Wider long pastas, such as tagliatelle and fettucini, do well with most sauces, as well. Some of the wider pastas are sold coiled up into “nests,” but there's really no advantage to them over the stretched out variety. Usually these are served with robust meat sauces, but I also like sauteing chopped fresh vegetables, and tossing them with fettucini and olive oil. Rectangular sheets of lasagne are used to make wonder baked dishes, most of which take their name as the noodle. If you want to avoid pre-cooking lasagne noodles, buy the “no precooking required” varieties. I don't know that it's absolutely necessary, though. My wife makes a really good lasagne without precooking, and uses the regular noodles. Prepackaged cannelloni tubes, or very large shell pastas, are often stuffed with cheese or meat and then baked in a tomato or white sauce. The Chinese make several different kinds of noodles. The most common for Americans is ramen. Sold dried, ramen looks a lot like tangled yarn that's been pressed into small bricks. Most varieties don't really need to be cooked. Just letting them soak in warm water for a few minutes is generally enough. They make great additions to stir-fries and soups, and can serve as accompaniment to many dishes. Sometimes additional ingredients will be included with the pasta dough, giving it a distinctive color – spinach for green pasta and tomato for red pasts, for example. The added flavor tends to be very light, bordering on non-existent. When cooking colored pasta, or whole wheat pasta for that matter, if you want to taste the distinct flavors, pair them with mild sauces that won't compete with the pasta for flavor. I love pasta. All kinds. Spaghetti, rigatoni, lasagna, macaroni, penne, you name it. My family does, too. Fresh or dried, it's all good. Pasta is such a staple ingredient, too. It's used in so many dishes: soups, casseroles, stuffed with meats or cheese, smothered in sauces - the possibilities are endless. Pasta and Italian cooking just can't be separated. Legend has it that Marco Polo brought the secrets of the famed noodle from his travels in China but, archaeological evidence suggests that it was eaten by the Etruscans, Italy's earliest known inhabitants. It's popularity in Italy can be traced to the late 18th and early 19th centuries with the development of dried pasta. The first dried pasta was made with semolina flour, and no eggs, in Sicily. These ingredients, or lack of them, made mass production more viable and very inexpensive. By the late 1800's there were over 1,500 pasta manufacturers in Naples, alone. Because it was inexpensive, it became a staple food for the poorest of Italians, helping to fend off starvation. The role of pasta as a heroic food for Italy's poor was played out in the character of the hunchback Pulcinella - popularized as “Punch” from “Punch and Judy” fame in England and America. Unfortunately, Pulcinella's role as mascot for the poor evolved into an image of Neapolitan gluttony. Pasta is truly a primal food. Many children in Europe and America are introduced to pasta as infants, being mixed in with some of their first solid foods. What child can resist tiny pastas, shaped into letters for alphabet soup or, more recently, the shapes of dinosaurs and characters from popular fiction. Dried pasta is a wonderful food choice for our busy modern world. With the myriad commercially canned sauces, it's quickly and easily prepared - and that's a good thing after a long day's work. I can't count the number of times spaghetti, with canned marinara sauce and a green tossed salad on the side, has been on the weekday dinner menu for my family. A favorite of my children's is macaroni and cheese. Like most Americans, I rarely make it from scratch. Instead, we use the prepackaged variety, even though it's not as tasty, or healthy. We've taught our oldest children how to make it, and now they can feed themselves in pinch. I like adding various spices, such as chili powder, dried onions, and chopped tomatoes to the mix. Cooked sausages or hamburger can be added, as well, to make a quick skillet casserole. In spite of my best efforts to dress it up, my kids still prefer it plain. I've decided to make April a kind of “pasta month” for Confessions of a Mormon Foodie. Stay tuned all month for stories, tips, and recipes dealing with pasta. After all, spring is here, and spring is all about love. I've talked about romance and pasta, before. It's all about hot and steamy pasta love, baby. If you're like me, once Easter is over, you'll have quite a few very pretty hard-boiled eggs left over. Eating boiled eggs for weeks can get boring. One way to spice them up is to serve them "deviled." Having just celebrated Christ and the atonement, bringing the devil back into the equation may seem a little odd. If that idea bothers you, don't think of them as being deviled eggs. Think of them as "de-viled" eggs. You're just taking the vileness out of them. Trust me. That sounded funny when I first thought of it. Anyway, here's a good, basic deviled egg recipe for you to try. Peel the eggs and cut them in half, lengthwise. Remove the yolks and place them in a bowl. Add the salad dressing, mustard, salt and pepper to the yolks, and mash the whole thing together with a fork to make a thick paste. Refill the empty egg whites with the yolk mixture. Sprinkle with paprika and serve. Eat deviled eggs the day you make them. If you need to refrigerate them, cover them with plastic wrap. Even then, they won't keep well for more than a day. If you want to get adventurous, try mixing a couple of teaspoons of chopped green onion in with the yolks, and maybe a few dashes of hot sauce. You could also substitute chili powder for the paprika, if you want an extra kick. For more great deviled egg recipes, visit The Deviled Egg Gourmet. Coloring Easter eggs is fun. The last few years my work schedule has been such that my wife and kids usually color eggs without me, though. Mostly they just get out crayons, paints, or magic markers or something. I'm not going to let that happen this year. I'm going to make sure I sit down with my kids and color these Easter eggs properly. Getting messy with your kids is fun, even if it does mean having multi-colored fingers for a week. Start with cold, hard boiled eggs. You don't want to get burned trying to dye a hot egg. It can be a good idea to wash the eggs before you boil them, too. Some commercial egg sources will coat the egg with an oil to help protect them, and it can interfere with the dye. I prefer using white eggs, not brown, when coloring Easter eggs. The white shell gives brighter results. Also make sure the eggs you choose are free from cracks. Nothing says "yuck" like a boiled egg with its whites hanging out. Use old newspapers to cover your table, and old shirts or smocks to cover your kids. This can get messy. Pour the hot water and vinegar into small cups. Make sure the cups are deep enough to hold both the water and the egg without overflowing. Add enough food coloring to get a very dark color. The dye needs to be several shades darker than the color you're going for. Using your fingers, and a spoon, gently set the egg into the colored water mixture until it's the shade you want. The longer it sits, the darker it will get. Don't worry. If you take the egg out early, you can always put it back in the dye a little longer. I've heard you can leave them in the dye for as long as two hours, if you really want to. Put the dyed eggs back into the boxes you bought them in and let them dry. It just occurred to me that a cooling rack, over the newspaper, might work better. Refrigerate the eggs if you want to eat them later. 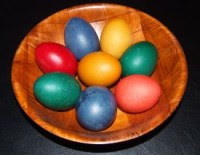 If you want to get fancy, try holding in half of the egg at a time, in different colors of dye to create "bands" of color. Another cool trick is to write messages or draw pictures on the eggs with different colored crayons before dying them. The wax in the crayon repels the dye and you can get some pretty cool effects. The point of coloring Easter eggs is to have fun. Experiment! Who cares if they look awful later? You can always peel off the shell and devour the evidence. With Easter coming up, you knew I'd have to do something with eggs. Eggs gained a bad reputation during the 1970's and 80's. The whole “avoid cholesterol” thing. The fact that the membranes of our cells are about 50% cholesterol, and that our body makes it's own cholesterol if it doesn't have enough, never seemed to enter into that conversation. So now that we're on to newer diet fads, it's okay to have an egg or two once in a while. Eggs are very inexpensive complete protein sources, and one of the easiest things to cook. One of the first things I learned to do in the kitchen, after making toast and peanut butter sandwiches, was to fry an egg. 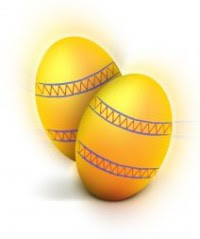 With Easter coming, we're going to boil them, instead. I like boiled eggs. I remember my Dad eating a boiled egg with breakfast nearly every morning, when I was a kid. Soft boiled eggs and toast was a traditional breakfast dish for many families. They were so popular that people actually made little egg stands to hold the egg while they dipped the toast into the still liquid yolks. Remove the eggs from the refrigerator. A lot of people like to let them sit until they come up to room temperature (about 30 minutes) before boiling to avoid cracking. I overcome cracking in a less time consuming way. Put the eggs into a small to medium saucepan, depending on how many eggs you want. Unless I'm cooking a dozen eggs for Easter, I don't cook more than two or three at a time. Add enough cold water to the saucepan to just barely cover the eggs. Just don't put so much water in that it will boil over. Cover the pan and bring to a boil. Bringing the eggs up to temperature with the water helps avoid cracking the shells and you ending up with badly poached eggs. Once cooked, remove the egg with a slotted spoon and slice across the top of the egg with a sharp knife to expose the cooked whites, and runny yolk. Sprinkle a little salt on the exposed egg and serve with toast strips for dipping. After cooking, drain the water from the pan and then pour cold water into it, once again covering the eggs. This makes it easier to crack and peel the shell. Warm eggs are a great treat, but make sure you let things cool long enough that you don't burn yourself. I learned to eat eggs this way from my Dad. I introduced this to my seven year old the other day and now it's her favorite way to eat eggs. Take a warm, hard boiled egg, remove the peel and place into a small bowl. Add a half-teaspoon of butter, and a dash of salt and pepper. Smash the egg into very small pieces, almost like a rough paste, with a fork, mixing it with the butter, salt and pepper. Enjoy! Easter came early this year! I've always liked Easter, even as a kid. I'm not sure why. Maybe it was because it was one of the few times when we would “go south” to visit my cousins without impeding on my own time. I hated that during Christmas but, for some reason I enjoyed it at Easter. It was a big family get-together at that time. Pretty much everybody from my mother's family would get together in the mountains around her home town of Redmond Utah, eat food, play games and roll easter eggs. What? You've never rolled easter eggs down a hill to break the shells? I'll admit, the idea sounds more fun than the reality – if you want to eat the egg, anyway. Most of the time they'd roll down and break apart on the rocks. If they didn't break apart you'd have to wash them after peeling because of the dirt and plants you picked up along the way. If you weren't too keen on eating the egg, though, rolling them down hills was fun. It was particularly cool if you could find a larger rock in the path. You'd aim the egg for the rock and push it along like some kind of mutant bowling ball. If you were lucky, it would hit the rock and splatter apart in a great explosion of white and yellow. Decorating easter eggs is fun, too. My mom would buy the commercial egg dyes for me. I'd go at it on the dining room table, nearly gagging to death on the vinegar fumes, but still having fun. Sometiems my friends or my older brothers would join in. Trying to find new ways to make the eggs as fancy as we could, using crayons, egg dyes, and anything else we could come up with – that wasn't immediately discouraged by my mother once she figured out what we were up to – was fair game. Who says you shouldn't play with your food? As an adult, my wife and I have brought our love of egg decorating to our kids. My wife's family has helped us out on this front by sponsoring an annual Easter egg decoration contest. The contest is pretty cool, too. My wife's designs have won a couple of times. No great prizes, mind you. Just the best kind when it comes to family games: chocolate and bragging rights. I think she took first prize that year. As a husband and a father, there is one inescapable truth that my family, my friends and I, must deal with on a daily basis. It has been a part of my daily existence since I was born. My wife considers it to both a boon, and a bane. You see, I'm a man. Males of the species have had certain obligations since the time of Adam. We're expected to hunt, kill wild beasts for food, and bring it back to the tribe. We're expected to know how to use and make tools and gadgets for our work. We are expected to care for our families. Not much has changed in all those years. It's a typical stereotype that all men are into tools and gadgets, even today. Not many of us use clubs and flint knives anymore. When we think of tools and gadgets, we normally think of saws, hammers, axes, wrenches, screwdrivers and all of the fun toys that are associated with mechanics and handymen. It's no different when it comes to the kitchen, though. Today's society has just made it easier. Instead of hunting in the forest, we go to the local grocer. Instead of wielding clubs and spears, we wield credit cards and cash. And we still love tools! Watching a handyman drool and grunt over a new circular saw or cordless power drill has become a cliché. It's no different for men who love to cook. We love our tools. They just happen to take the form of skillets, chef's knives, stock pots, and blenders. It's just as dangerous for me, as a foodie, to go into a local kitchenwares store as it is for a handyman to go into a hardware store. Even if we go in “just to look,” chances are we're coming out with some new tool or gadget. Women are not immune to the power of the kitchen gadget, either. They just don't grunt and make "ooh ooh" noises like men do. When buying equipment for your kitchen, you need be careful. Frugality doesn't always mean spending less money. Sometimes, buying an inexpensive brand, just because it's inexpensive, creates a “false economy.” You might think you've saved money but, the item will have to be replaced more often. You'll end up spending more money in the long run than if you'd bought the better quality, more expensive, stuff in the beginning. Don't get me wrong. I don't want you to break your bank account to buy kitchen equipment. Just buy the best you can afford. 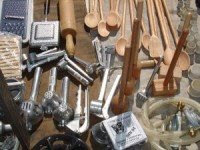 Good equipment will last a very long time, make food preparation easier, save you time, and make cooking more fun. You don't need to buy a whole bunch of equipment all at once, either. If you're just starting out, keep your purchases to the bare minimum you need. Over time, you can collect more pieces as you need them. This helps you spread out the cost and prevents your cabinets and counter tops from becoming so cluttered with equipment you don't use that there's no room to cook! Once you buy a new piece of kitchen equipment, use it! Make stuff with it! That's why you bought it in the first place, right? Get cooking! Where's the fun in having cool tools if you don't play with them ... um ... use them once in a while? Ah, Saint Patrick's Day – when we all wear green and pretend to be Irish. I don't have much Irish blood in me, at least none that I know of. Welsh, maybe. Mostly English and Danish. Oh, but faith and b'gorra (how do you actually spell that, anyway? ), on Saint Patty's day I kin be as Irish as I please. I may not have Irish blood but, I do have a bit 'o blarney in me. Corned beef and cabbage are traditional fare for Saint Patrick's Day, along with beer. Being a Mormon I don't do the beer thing, but I still like to wear green and have fun. One of my favorite Irish recipes is Irish soda bread. Soda bread is made without yeast and is pretty easy to make. It's got a nice crumb and cooks up in no time. I think it's best eaten warm, the day you make it. I've tried several soda bread recipes. Like everything else, some are better than others. This one's pretty good. It's a variation on a soda bread recipe I got from Emeril Lagasse, one of my chef heroes. This is the first one I've tried that had fruit and spices in it, although I've discovered that's fairly common. Boil some water. Put the currants in a bowl and cover with 1 cup of the boiling water. Let them sit and rehydrate for 10 minutes, and then drain well. In a large bowl, mix the flour, whole wheat flour, baking powder, baking soda and salt. Add the butter and mix together with your fingers until it resembles dry crumbs. Add the caraway seeds, molasses, buttermilk and raisins and mix together with a spoon or hand mixer (with dough hooks) until a wet dough forms. Do not over mix! Place the dough on a lightly floured surface and knead just a bit, until it all comes together. Shape into a flat round about 1 1/2-inches high. Cut a cross in the center of the dough with a knife, about 1/4 inch deep. Brush the top of the dough with buttermilk and sprinkle with the oats. Don't over do the topping. Transfer to a baking sheet and bake about 30 or 40 minutes until light brown and cooked through. You should be able to put a knife into the center and have it come out clean. Remove from the oven and cool slightly on a wire rack before slicing. Serve warm with butter or Dubliner cheese. Yum! March 20th is the Great American Meat Out Day! I just learned about this from my friends at Mahalo, but it sounds kind of cool. Starting in 1985, the Farm Animal Reform Movement has used this day to encourage people to "go vegetarian." I'm not a vegetarian by any means. I enjoy a good double cheeseburger every so often. If you've read the recipes in my blog, though, you'll see that a lot of them features veggies (like my vegetable smoothie), and are easily modifiable to be completely vegetarian (by substituting vegetable stock for chicken stock, for example). I'm not ready to quit eating my animal friends all-together but, I'll definitely be observing FARM's Meat Out day. For more information, head over to the official Meatout site.